'He Belongs To The World': The Powerful Work Of Jailed Bangladeshi Photographer Shahidul Alam : The Picture Show Photojournalist and activist Shahidul Alam has helped nurture a generation of South Asian photographers. He was jailed last month on charges of "spreading propaganda and false information." 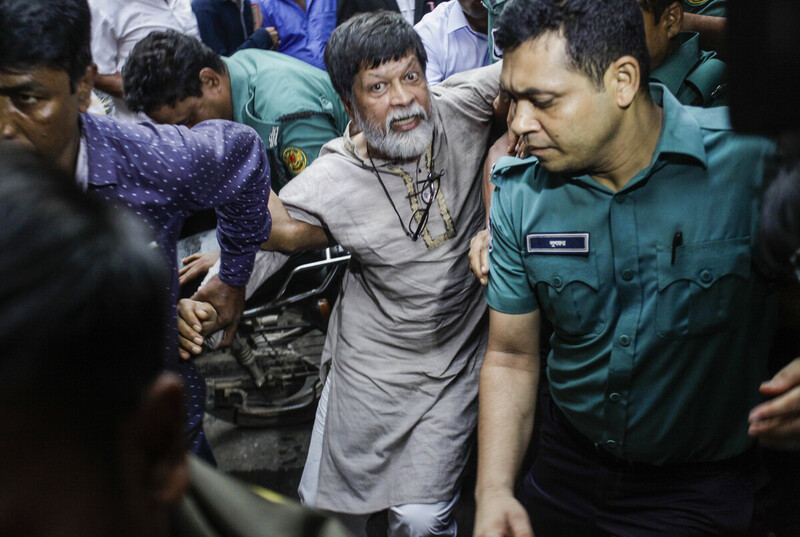 Shahidul Alam, surrounded by police, arrives at a Dhaka court on Aug. 6. Nobel laureates and human rights groups have called for his release. That's what Shahidul Alam, an acclaimed Bangladeshi photographer, educator and activist, said on Aug. 8 as he was being transferred to a police office in the capital Dhaka. Three days earlier, Alam, 63, had been detained, charged with "spreading propaganda and false information against the government" online, under a law the government has repeatedly used to punish criticism against it. 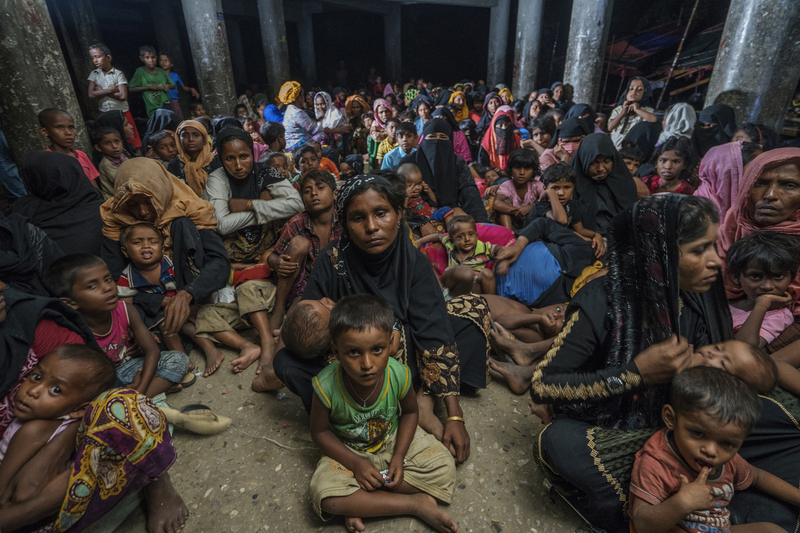 Last November, Shahidul Alam photographed Rohingya refugees in a Bangladeshi cyclone shelter. 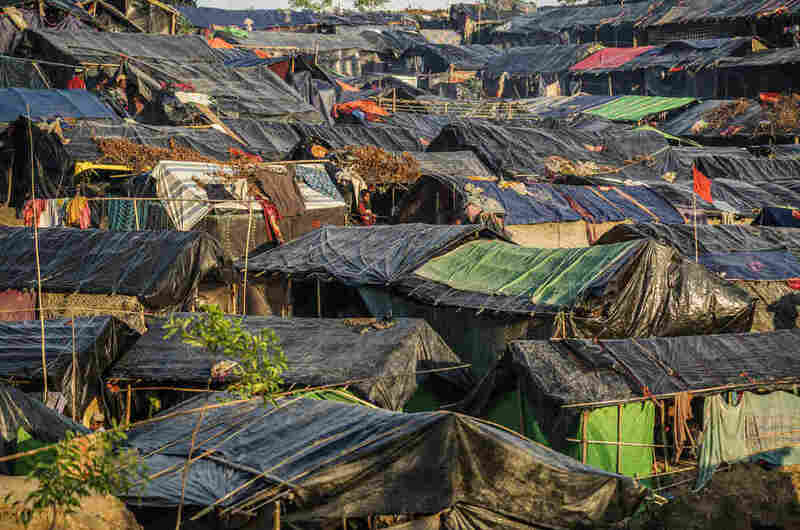 Alam photographed densely packed homes in the Balukhali refugee camp for Rohingya from Myanmar last November. 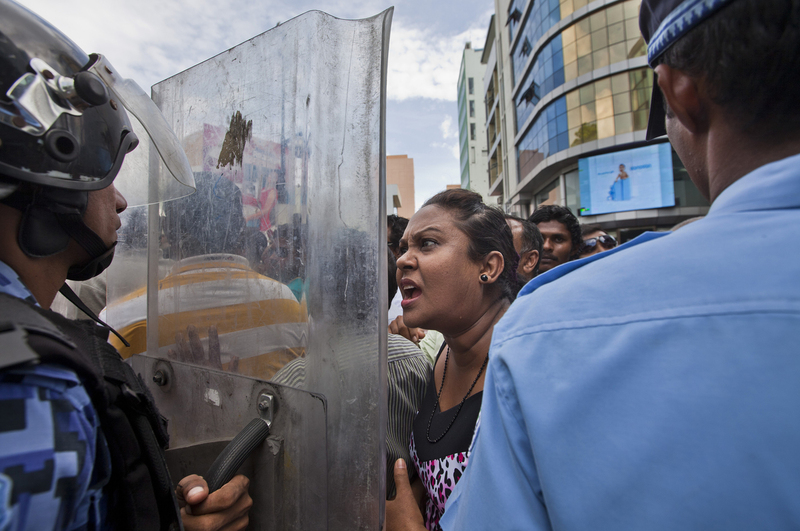 Shahidul Alam covered protests in the Maldives in 2012, as former President Mohamed Nasheed arrived at police headquarters in response to a summons issued by the Maldives police. Alam is synonymous with photography in South Asia. In a career spanning more than three decades, he has chronicled his country's tumultuous history, photographing natural disasters, political upheaval, human rights abuses and, recently, the conditions facing Rohingya refugees who fled to Bangladesh from Myanmar. He has also covered stories elsewhere in the region, including places rarely visited by journalists, such as the Maldives. Just as importantly, he has also served as a mentor, having started the Dhaka-based Drik photo agency, a respected photography school and an international photo festival — collectively providing a foundation to inspire and train a generation of photographers and photojournalists. Police picked up Alam from his Dhaka home after he appeared on Al Jazeera TV and posted videos on Facebook condemning the government for its violent response to student protests that began in August over road safety. In the Al Jazeera interview, Alam said the protests were largely a release of "pent up" anger over a series of government abuses, including extrajudicial killings, disappearances and corruption. A court denied Alam's request for bail on Tuesday. Since his arrest, calls to "Free Shahidul" have come from around the world, from Nobel laureates including Archbishop Desmond Tutu, human rights groups, U.N. experts, photographers, artists and academics. "Shahidul Alam's detention underlines the growing crackdown on dissenting voices in Bangladesh, in a pattern that is visible elsewhere too," says one statement. "Shahidul has for years been a leading light among non-Western photographers in what he called the 'majority world,' teaching many of us near and far by example, and with his indomitable spirit and dignity," Sim Chi Yin, a photographer with the Magnum photo agency, said in a statement after Alam's arrest. "It's distressing to see this happen to a person who has sought justice for others all his life. " 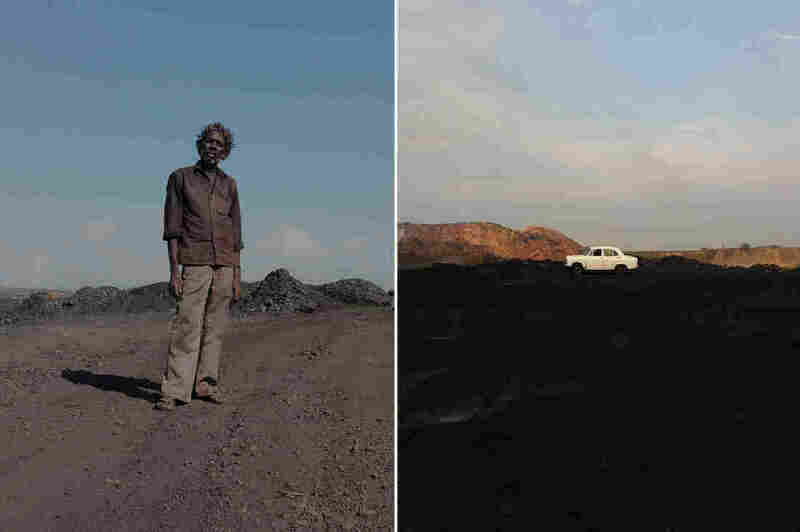 "He belongs to the world"
Left: A contractual laborer at one of the coal mines in Jharia. "I'm trying to show the worker in a powerful way," says photographer Ronny Sen. Right: A white Ambassador car, which Sen calls "the symbol of Indian bureaucracy," is a signal to illegal coal pickers to run away from the mines they scavenge. "There is not a single documentary photographer in the [Indian] subcontinent who is untouched by Shahidul," Kolkata-based photographer Ronny Sen, 31, one of Alam's proteges, tells NPR. "He belongs to the world." After earning a Ph.D. in chemistry in the United Kingdom, Alam returned to Bangladesh, determined that his country should tell its own story rather than relying on the eyes of foreigners. He launched the Chobi Mela International Festival of Photography in Dhaka in 1999, and photographers from around the world were exposed for the first time to personal narratives from Bangladesh. The theme for the first Chobi Mela festival was Bangladesh's 1971 war for independence from Pakistan and the slaughter of Bengali civilians by Pakistani soldiers. It was the first photo exhibition Andrew Biraj attended, and inspired him to pursue photojournalism. "That was something very important historically, and very surprising," Biraj, a 35-year-old Bangladeshi photojournalist now based in Washington, D.C., tells NPR. "The most unique thing was that it was original — we started documenting our own stories in our own society." A woman mourns over a relative who died in the Rana Plaza building collapse, in Savar, Bangladesh, April 24, 2013. Biraj enrolled at Alam's Pathshala South Asian Media Institute as a beginning photography student and went on to become a daily news photographer, covering Bangladesh, Afghanistan and Myanmar for Reuters. Working in Washington, D.C., his photos have been published by Agence France-Presse and The New York Times. Pathshala, with its focus on social documentary photography, motivated Biraj and his fellow classmates to seek deeper coverage. "Since covering news, I came into lot of incidents that were shocking and heart-wrenching stories, so I felt I needed to tell more of these stories," he says. From 2008 to 2014, Biraj set out to document conditions in the garment industry in Bangladesh, the second-largest in the world. "The workers of this sector have been oppressed and discriminated by the government," Biraj says. "I know a lot of workers who became unable to work anymore after surviving work accidents like the Rana Plaza collapse." 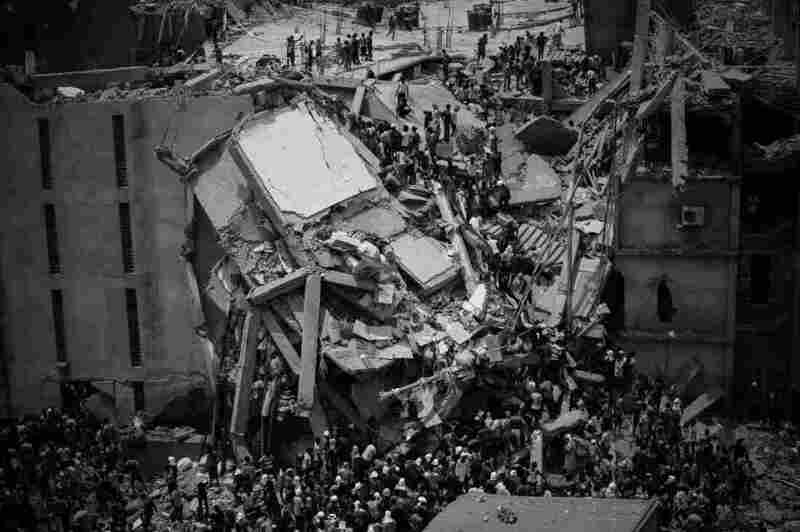 On April 24, 2013, the collapse of the eight-story Rana Plaza building outside Dhaka killed more than 1,100 people and injured thousands of others. 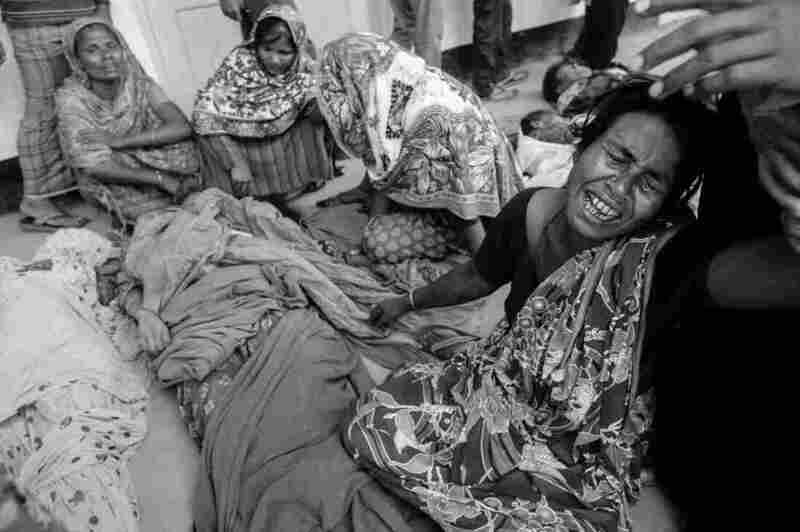 It's considered Bangladesh's deadliest industrial disaster. A focus on "the dignity of the people"
Biraj's stories don't end after the photos are shot. 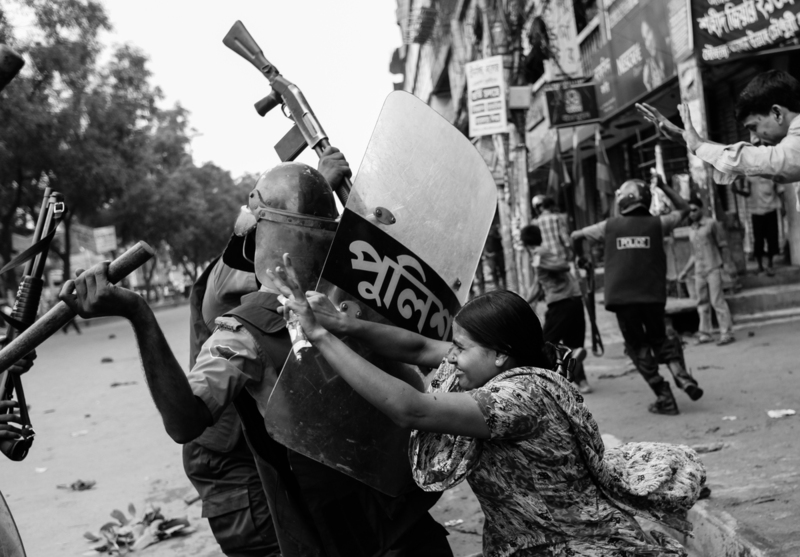 Rahela Akhter, a Bangladeshi garment worker, tries to resist beating from a police officer in riot gear during a protest in Dhaka, June 2010. Dozens of garment workers were injured in clashes with police when they took to the streets demanding higher wages. People rescue garment workers trapped under rubble at the Rana Plaza after it collapsed in Savar, outside the Bangladesh capital of Dhaka, on April 24, 2013. The collapse of the Rana Plaza factory complex is considered Bangladesh's deadliest industrial disaster. 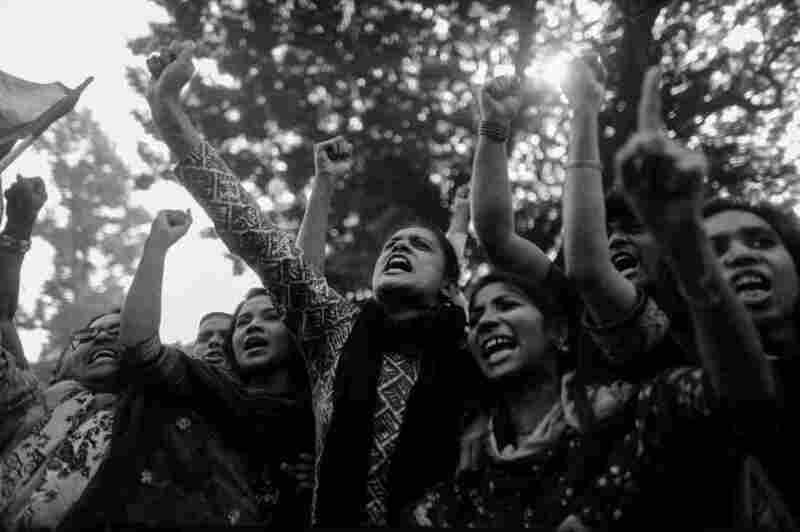 In November 2013, garment workers and leaders protest the deaths of their coworkers, who were killed in the Rana Plaza fire. 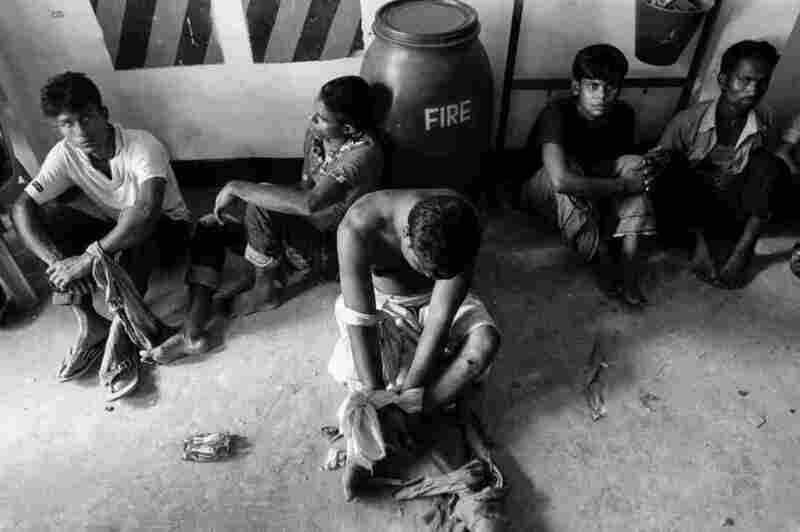 Workers suspected of vandalizing a car are detained by factory security personnel in Savar in May 2012. "I wanted to take the photos back to where I took them," he says. Around the one-year anniversary of the Rana Plaza collapse, Biraj invited survivors to his exhibition of photos, where they could share their firsthand accounts with the public. Alam, says Sen, understands the power of photography to bring Bangladesh's culture, politics and history to a Westernized media that often casts the region as monolithic — an impoverished, exotic "Third World." Too often, Sen says, photographers parachuting into foreign lands "take the power away from the people when they photograph them." 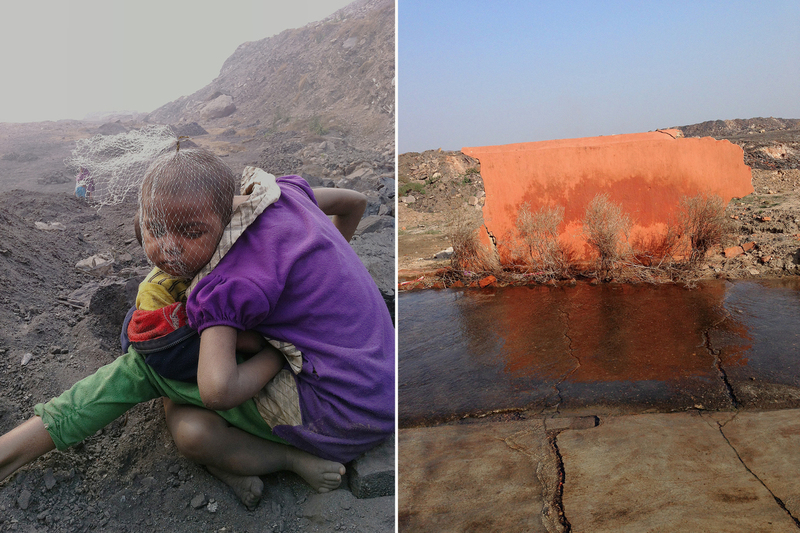 Left: Two children sit in the cold of Jharia, waiting for their parents to return from work. A plastic net covers the head of the younger child. "They had been playing with trash," photographer Ronny Sen says. Their parents are illegal coal pickers whose livelihood depends on scavenging coal from the mine. Right: After mine blasts and fires, the orange wall of a broken temple remains. Speaking with NPR in 2011, Alam recalled a request from U.S. photo editors after a cyclone struck Bangladesh two decades earlier. "They wanted bodies," he said. "They wanted destruction. They wanted to show the horror of the cyclone, which was important, of course. But what is also important was the fact that people were rallying around to support each other; that farmers were replanting their seeds; that fishermen were going out into the sea; that human beings were trying to rebuild their lives." Sen's own images reflect lessons he says he learned under Alam. "Shahidul taught us how to give the dignity of the people," he says. Sen has focused on stories such as the hellish terrain of the Jharia coalmines in India's Jharkhand state, and the people who inhabit it. He now draws on what he's learned from Alam as he teaches other photographers. 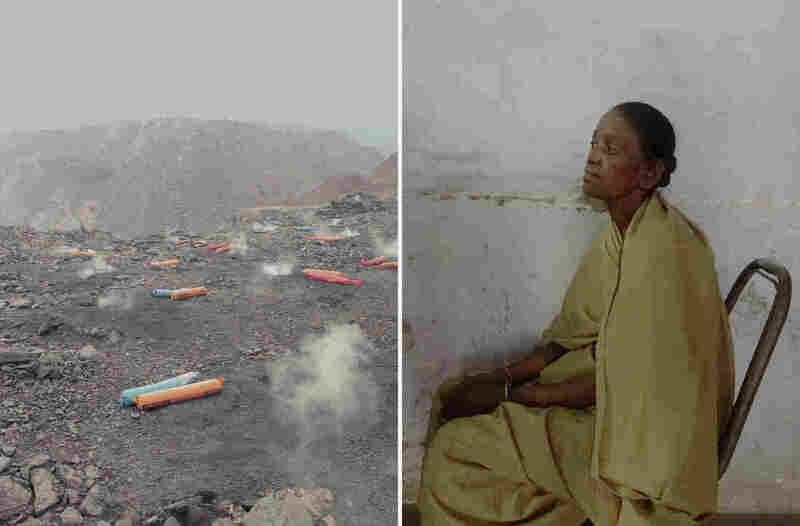 Left: Dynamite, used to break up rock for excavation, is scattered across the Jharia coalfield. Smoke rises from underground fires. Right: A woman sits in a broken chair outside of a mine official's office. She was hired as an office assistant after her husband died in a mine blast. "I try to engage my students the way Shahidul has engaged with me," he says. "You can only keep what you have by giving it away." Last week, the high court directed the government to provide Alam with better jail cell conditions after his wife Rahnuma Ahmed filed a request. Alam says he was beaten in custody, a claim the Bangladeshi government denies. He wanted medical attention but had not sought better prison facilities, his cousin Nasima Khan says, because he wanted to stay with other ordinary prisoners. Khan, based in Washington, D.C., has been receiving updates about Alam's situation from family members who've been allowed to visit him. "He said when he gets out of prison, he'll start working on prison reforms," she says.